Discussion in 'BigBox General Chat' started by Stian Indal Haugseth, Sep 23, 2016. Didn't find much about board alternatives for the BigBox doing a quick search. I have been following the Duet Wifi thread with interest but I'm holding back as it is only possible with 5 steppers as of now. For a dual machine we need a stepper more or two than the single. So there is not a lack of 32 bit boards for a single machine. For future needs and a dual X carriage design we need at least 6 steppers: X0, X1, Y, Z, E0, E1. I have also started using dual Z stepper drivers so I need (want) 7 if I go for the dual X carriage later. So far I have identified these boards. I have not looked into firmware and support for whatever is needed but RADDS is at least supported by Repetier and Marlin (not sure of the maturity). RADDS for Arduino Due, kommer med mulighet for 6 steppere og kan økes til 8. Is there any I have forgotten? The smoothieboard is a 32bit one which is doing a rather stellar job. You could use two together, so since you have 3, 4 and 5 controllers per board, you can make all combinations you want with it. Though I haven't been digging into it more yet, it should be possible. Even more interesting is the chainable extension for the smoothieboard v2, technically meant so you can chain as many extruders as you want, but in the end, it's a stepper driver with some extras. But that is not yet out and will take a while until we see that happening. The duet is extremely well supported. Check out their forum, they are really quick to take on ideas from the community. They are currently working on a duet WiFi expansion board and I have no doubt that this will be out soon. As for dual z steppers, this is not needed on the duet WiFi as they give you the option of having your z motors in series or parallel, the only board I've seen with this option. Personally I'm very surprised the big box uses dual Z motors as it's an inferior method to using a single motor and a belt. The idea was made popular by the i3 as Stepper motors are cheaper than a belt + bearings. The duet WiFi team however, are currently working on a triple Z motor set up for the duet WiFi, so that your bed can automatically level itself. Win! Well, the reason I have moved away from wiring the Z in parallel is because I need it. My printer is available for any kid in the house. Even if they are not allowed to touch it they are when I'm not looking. I need to have bed leveling on Z0 and Z1. Repetier supports this and soon I will have dual Z max endstops as well. As soon Duet has an stepper extender it will become a contender. How can I use two smoothieboards together? Link please. I'll try to find it again, I know I saw this somewhere (and I will need it too for my next project) so as soon as I have it, I'll post it here. There it talks about adding more stepper motors to the free GPIO. However, wiring additional drivers is as simple as using free GPIO pins. The wiring of two boards together I haven't found again yet. Sorry, I'm not sure I understand. Are you using 2x Z-drivers and steppers so that the screws cannot go out of sync when small children fidget with it? An understandable point, this is exactly why I use 1x motor+driver moving 2 lead screws via a GT2 closed loop belt. It is very hard to force this system out of sync. 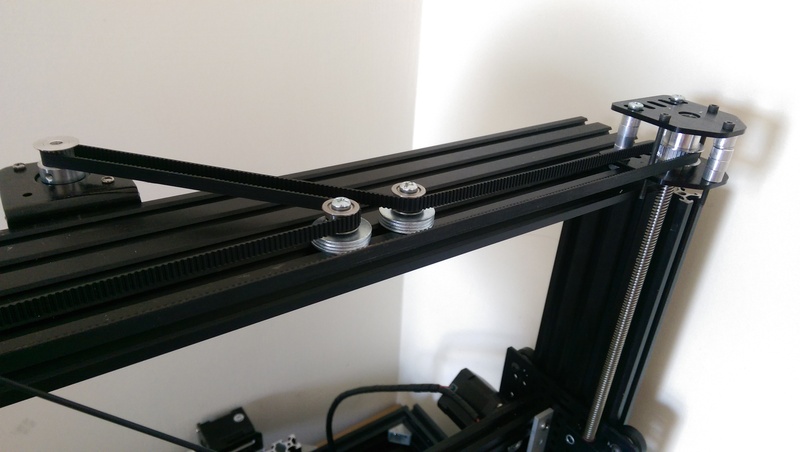 you can actually just tug on the belt to move the Z-axis during maintenance or to get the X-axis out of the way when you remove prints, etc. Since installing this set up, I have not once had to re-calibrate my printer. Personally I think this system is better as it can't go out of sync during the print, and it is a simple mechanical solution requiring no software/firmware solution. This is just food-for-thought though, as I'm not sure how this set up would work on a BigBox, if at all. @GeckoBox3D, the BB has two Z motors running each their Z screw. They were parallel wired to single driver bu I have added a second stepper driver to be able to level them automatically. I have considered rebuilding the BB to a single motor like you have but for now dual Z is more simple. Ok I found the part where I read it again and it's on the "todo" list :/ Simply using an external driver with the gpio seems to be the best alternative.